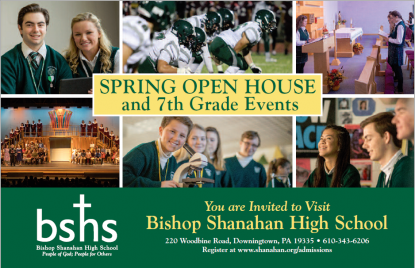 Wednesday, March 21 at 7 p.m.
Wednesday, March 21 at 9 p.m.
Join us at Bishop Shanahan High School on Wednesday, March 21 for the Spring Open House from 7 to 9 p.m.! Learn about our academic program, meet faculty, coaches and current students, tour the campus and experience classroom demonstrations. All are welcome! RSVP here.